Bounce rate are directly reflect to your site visitors who leave your site after viewing only your main or one page. 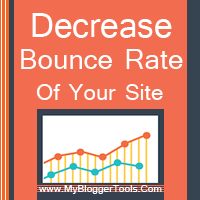 so the "Bounce" rate means your site visitors don,t like your blog/website structure. i discuses to you some thing you should use to your website and after that visitors on your pages longer to stay on your page. and these strategies will help you to grow down your website bounce rate. Your website,s font size must be larger than or equal to 16 pixels. and your site easily to open and read to multiple devices, Mobile or desktop computer or Laptop, iPad and etc. paragraph line and length, or fount size should be balanced. and always use clear and good decent fount. if external links are open in the same window, your readers away from your website/blog. because readers linked to other site or URL, so keep them longer on your site make external links to your website/blog, and open in a new window only. always use external links to open in a new window will keep your readers retained on your website/blog. How To Make Money Online ...:::: Earn Methods ::::... Internal Links are that link which show to your web page of your own website. as much as (Internal Links) within your posts which keep your "visitors" engaged with your Quality content only. and this will ensure that the "readers" visit or see more pages. and the tactics reduces the bounce rate of your website. always use links to your first and second paragraphs of your post. and some links are placed towards the bottom of your post. always use beautiful social sharing widget and simple "web" design. and use lite or simple color combinations, with great site design. use these settings to convince your visitors to stay longer to your website. 1: Use User Friendly layout, Thames, Template. 2: Don,t use too many Advertisement on your website. 3: write good and unique content, and easy to read. 4: use at last one image in your post. 5: Reduce your website loading time. 6: reduce your website/blog speed. So always use above instruction to grow down your bonce level. just use your common sense. and always write good and quality article. link your site to (Google Analytic) to see your bonce rate live. make your site user friendly. and happy blogging.